ANOTHER white revolution is in the air. It is not like the one in the past—the one that catapulted India from being a milk-deficient country to one of the world’s largest producers of milk. Yet the revolution is being fast joined by a growing tribe of health-conscious Indians who want the healthiest food on their tables. Unlike the National Dairy Development Board that steered the earlier white revolution, entrepreneurs and corporates are taking the lead this time. More than milk, they are selling an assurance: to provide pure and fresh cow’s milk. The assurance is beguiling at a time when news reports flash incidents of milk adulteration. In 2012, the Food Safety and Standards Authority of India had found that 70 per cent of the milk sold in the country was tainted with everything from water and milk powder to urea, detergent and banned hormones used to extract more milk. “Even the packaged milk has its own ills. It does not specify if the milk is of cow, buffalo, goat or mixed,” says Anita Duggal of South Delhi who swears by the nutritive value of cow’s milk and prefers it for her children. Duggal’s search for pure cow milk ended a few months ago when she came across the website of Oleche, a start-up dairy firm that claims to provide organic cow milk. Oleche is also the result of a similar search. Says Mani Agrawal, founder of the dairy, “When I relocated to India in 2013 after living in US and Europe for more than two decades, I hated the taste of the pouch milk from cooperatives.” The management consultant then decided to set up his own dairy. He bought land in Uttar Pradesh’s Badraula village, not faraway from Delhi, and a dozen of Holstein Friesain cows. “It is the highest-yielding breed available in the country,” says Agrawal. Since milk is a highly perishable item, he set up a pasteurisation and packaging unit on the farm. “We transport the packaged milk in refrigerated vehicles and deliver it at the doorstep within 12 hours of milking,” he says. 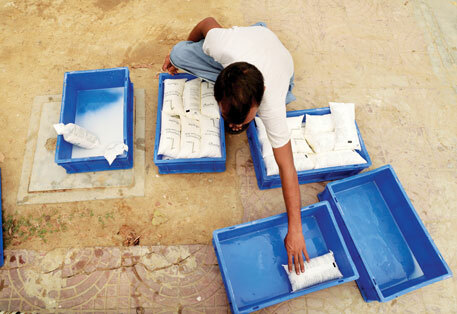 Oleche supplies milk to 400-odd customers in Ghaziabad, Noida and South Delhi. From Ghaziabad to Gurgaon and from Mumbai to Punjab, a number of players are providing the premium milk and are charging a premium for it—a litre of fresh-from-the-farm cow milk is priced anything between Rs 60 and Rs 80. By comparison, Mother Dairy milk costs Rs 38-Rs 46 a litre. Those involved in the business say the high cost of the milk is because of the effort that goes into maintaining purity. 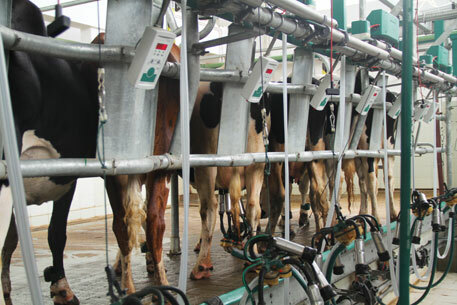 “We have state-of-the-art automated milking system that ensures no hand or air contact. The milk is piped directly from the udders to the pasteurisation and packaging units,” says Sanjay Agnik of TruMilk, a dairy in Ludhiana. “The system leaves no scope for any kind of interference or adulteration,” he adds. After winning over customers in Punjab, TruMilk has expanded its business to Delhi and created a customer base of 900 over the past year. “Embassies are our star customers,” he says. “Ensuring quality is not cheap,” says SandeepSubba of SimplytheMilk. Subba set up the dairy with a fellow retired soldier Mahipal Singh at the latter’s farm in Bahadurgarh, Haryana. “We have a herd of 90 Holstein Friesain and jersey cows. If a cow falls sick, we quarantine it till it recovers and do not milk it for another 15 to 20 days to avoid traces of medicine in the milk. While this ensures quality, we incur losses,” he adds. Some go that extra mile to pamper the cows. “We feed them organic feed grown on our farms, massage them with mechanised brushes and play soothing classical music for them,” says Sarika Chauhan of Sarda Farm, a venture of the beedi-to-real estate Sarda Group. It first introduced its milk in Nashik. Within two years, it has expanded the business to Mumbai and Delhi. “Our happy cows produce better milk,” reads its website. So believe people at WhollyCow, a venture of Landmark Group, which also owns information technology, real estate and solar power companies. To gain the trust of customers, WhollyCow has got organic certification for its milk and milk products from a French certification organisation, Ecocert. It has also introduced the concept of farm tourism. “We want people to visit our farm on Sohna Road near Gurgaon, experience how we maintain the cows and the farm, and then buy our products,” says Sanjay Sahni of WhollyCow. Several schools bring students for a tour to our farms. This is a great learning experience for them as most of them have little idea about the origin of milk, he adds. To entice its niche customers, TruMilk has recently changed the packaging and introduced food-grade plastic bottles. “People these days follow the Western lifestyle and prefer drinking directly from the bottle,” says Agnik. Though its bottled milk is Rs 5 costlier than pouched milk, Yagnik claims that the sales of TruMilk has doubled since the company lunched the product. The market for farm-fresh milk is minuscule and niche. “There is a growing base of consumers who are asking for organic milk, and we are yet to cater to even one per cent of them,” says Agrawal who plans to buy more cows to meet the demand for his milk. While the milk supplied by these modern dairy farmers may be safe, the nutrition-conscious lot should apply judgement. Scientific studies show that milk from pasture-fed, free-range cows contain more nutrients—omega-3 fatty acid, Vitamin E and beta carotene—than that from farm cows that are fed cereal rations. Will these corporate dairies affect small farmers who were instrumental in the white revolution? A highly-placed official with Bihar’s state milk cooperative, Sudha Dairy, does not think so. “We are not yet able to provide milk to all the people in the country. With more players joining the dairy sector, the country’s milk producing capacity will further increase.” The official, however, says the government should monitor if the claims made about their “premium” milk are true. It should also introduce a mechanism to bring about parity in milk pricing, says the official. This is growing fad nothing more. Currently milk demand in cities is outstripping supply, hence it is triggering mechanization and entry of private dairies and venture capital money like never before. These farms have started as niches, slowly they would expand in catering mainstream market also. The sustainability issue of this model and fad remains to be tested. If past experiments are any help this fad is not going to last as the critical customer mass needed to sustain it is highly volatile and shift their preferences like the FIIs. On the production front milking cows have a distinct productive life that needs replacement and quality control. And it is here that the narration of NIti Singh comes alive for the common man in the country. I was a resident of Delhi for more than Twenty years.I shifted to chennai permenantly in the year 2012.The milk qualty in chennai is not very good.The MotherDiary milk is of high quality.There is not even a single Diary run by local people in chennai.Cows milk is not available in any shop or dairyfarm.We have to depend on players like Aavin,Arokya,Tirumala and other brands.someone should establish such local diaries as in North. I am having farming land near to ghaziabad and i am interseted in dairy farming. Can you please guide me how we can start? where are all other new breed cows has A1 protein having peptide which causes a host of diseases? It was known for last 50 years but kept secret. A few years back it was made public by agribusiness professor and farm-management consultant Keith Woodford. He has written the book - The Devil in the Milk.